Goddess Lakshmi, consort of Lord Vishnu, is the goddess of wealth and prosperity. The word ”Lakshmi” is derived from the Sanskrit word Laksme, meaning “goal.” Lakshmi, therefore, represents the goal of life, which includes worldly as well as spiritual prosperity. 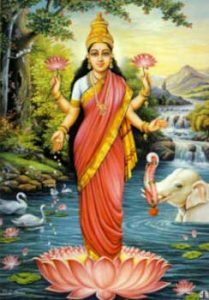 Lakshmi Maa is the Goddess of Wealth and Light. She is fair in complexion with four arms and is usually found seated or standing in a lotus flower. Other images of Lakshmi Devi picture her alongside her husband Vishnu Bhagavan or with Ganesh Bhgavan and Sarasvati Maa. She has four hands. In two hands she is holding a Padma (lotus), the other two hands are in mudras (hand gestures) one is the position of Abhaya (assuring protection) and the other is Varada (bestowing of favors). We worship Lakshmi Maa for promotion, success and personal virtues. Women who chant her mantra will develop irresistible beauty and radiance that shines from within. Hindus pray to Lakshmi Maa for various forms of wealth and for the removal of darkness. The festival of Divali is centered around Lakshmi Maa. Hindus use this time to clean and light up their homes to encourage mother Lakshmi to enter and live there.